Alex Rodriguez became the youngest player in major league history to hit 500 home runs, sending the first pitch he saw Saturday just past the foul pole in left field. Rodriguez stood at home plate for a second, waiting to see if his first-inning drive off Kansas City's Kyle Davies would stay fair. He threw his hands in the air after the ball landed in the seats and began trotting around the bases with a wide grin on his face as the Yankee Stadium crowd cheered wildly. When he reached the plate, he hugged Derek Jeter and Bobby Abreu, who both scored on the landmark home run, and blew a kiss toward the stands. His teammates were already on the field and he embraced several of them on his way back to the bench. The crowd buzzed and roared again when A-Rod stuck his head out of the dugout for the long-awaited curtain call, which came more than a week after he hit No. 499 and eight days after his 32nd birthday. After he took his seat next to Jeter, the Yankees captain reached out and playfully rubbed A-Rod's head as the two superstars laughed. The two were close when they were younger but Rodriguez admitted in spring training that their relationship had cooled over the years. Rodriguez surpassed Jimmie Foxx (32 years, 338 days) as the youngest player to reach 500 homers. A-Rod is the 22nd player to reach the mark, the second this season behind Frank Thomas. "Never, as a kid, did I ever think I'd hit even one," Rodriguez said after hitting No. 499 in a 7-1 win over Kansas City on July 25. Now he's considered a strong candidate to become baseball's career home run leader someday. First up though is Barry Bonds, who was two away from breaking Hank Aaron's record of 755 heading into San Francisco's game at San Diego on Saturday night. Rodriguez went into a tailspin after his previous homer against the Royals. He was hitless in a career-worst 22 straight at-bats before he singled in the second inning of Thursday's 13-9 loss against the Chicago White Sox. His 500th came in his 1,855th game. Only two players took fewer games to reach 500: Mark McGwire (1,639) and Babe Ruth (1,740). Rodriguez also became the third player to accomplish the feat as a Yankee and the second to do it in the Bronx. Babe Ruth hit his 500th at Cleveland on Aug. 11, 1929, and Mickey Mantle reached the mark at home against Baltimore on May 14, 1967. Yankees manager Joe Torre, standing next to the dugout mister on a hot summer day, saw the drive off A-Rod's bat and pointed toward the pole as it went out. One fan held up a yellow sign that read "501?" before his second at-bat, but Rodriguez walked on four pitches. He stole second, advanced to third on a groundout and scored on Wilson Betemit's single to give New York a 5-2 lead. He singled to right in the fourth, flied out to deep center in the sixth and singled to left in the seventh. The Seattle Mariners took Rodriguez with the first overall pick in the 1993 draft. One year later, he became the third 18-year-old shortstop in the majors since 1900. At that point, he gave little indication that he would develop into a two-time AL MVP and one of the game's greatest home run hitters. He went homerless in 17 games for Seattle in that first season, and hit five in 48 games the following year. But in 1996, his first full season in the big leagues, he hit 36 home runs. And after hitting 23 in 1997, he hasn't fallen short of 30 since. His seven seasons of 40 or more home runs are tied for fifth in major league history, and in 2001 he became only the fourth player with 50 homers and 200 hits in a season. A-Rod's first home run came on June 12, 1995, against Tom Gordon and Kansas City. He hit No. 100 in August 1998, No. 200 in May 2001 with Texas and No. 300 in April 2003 with Texas. 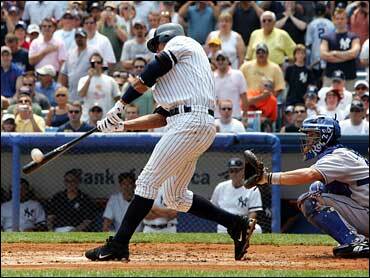 Number 400 came on June 8, 2005, against Milwaukee during his second season with the Yankees. He hit 189 home runs with Seattle, 156 with Texas and has 155 with New York. He is one of only three players, along with Reggie Jackson and Darrell Evans, to hit 100 home runs for three different teams. Rodriguez leads the majors with 36 this season, already surpassing the 35 he hit last year. "Fifty home runs doesn't seem to be an issue," Torre said recently. "Fifty home runs. That's incredible. You're talking about his age, you're talking about him hitting in the 50s  in a couple of years he'll be going for No. 600."